At Likud party meeting, Dep. Defense Minister says Jordan Valley belongs to Israel, calls on gov't to oppose US pressure. 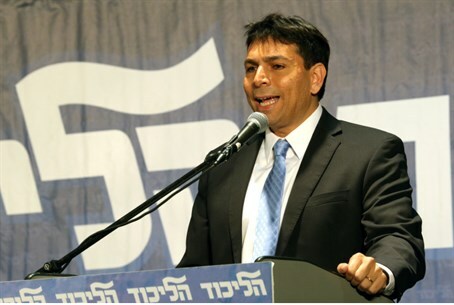 Deputy Defense Minister Danny Danon spoke at a Likud party meeting on Monday, wasting no time in voicing his support for a recent proposal to annex the Jordan Valley region, in eastern Samaria. "The Jordan Valley is a part of the state of Israel, and whoever thinks otherwise apparently is in the wrong party," he declared. Danon's comments come after a vote on Sunday by the Ministerial Committee for Legislation, which approved the annexation of the Jordan Valley. However, Justice Minister Tzipi Livni (Hatnua) pledged to file an appeal on the bill, further opining that she prefers a liberal Israel to a nationalistic one. The Likud meeting was called to address the peace talks with the Palestinian Authority (PA), and US Secretary of State John Kerry's security arrangement plans, which would see Israel gradually withdraw from the Jordan Valley in stages over the course of 10 years. Kerry reportedly will try to force the plans on Prime Minister Binyamin Netanyahu in January during a diplomatic "offensive" arranged by his staff. The US team has furthermore pressured Israeli generals to convince the skeptic Israeli public to accept the Jordan Valley withdrawal. "The Likud position on the topic is clear," remarked Danon, asserting that the Jordan Valley is part of Israel. "We must stand decisively and not recoil from the American pressure, we must remember always that our role is to ensure the security of the state of Israel." In the past Danon has said that Israel must oppose US pressure and not sign an interim deal that would place Israelis in danger.